Here is the latest vision about the future that I hold, one which might become a project, who knows. This is an extract form a book that arrived in my life by chance, an event I have to notice since I have not read any novel for some years now. Indeed, none seemed to catch my interest. 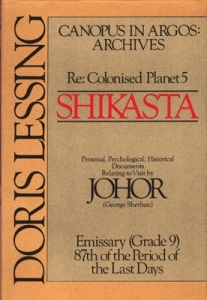 The title is Re: Colonised Planet 5, SHIKASTA, by Doris Lessing It is a science fiction book but you could almost drop the science of it. It is a take on the history of the human race, showing, as described above, the glory of its beginnings as it thrived under benevolent cosmic influences, watched after by a benevolent race of the Star Beings who implanted us on Earth; the downfall caused by an evil influence on the balance of the planet, down to a low point that is the collapse of our “civilization” in wars and inhumanity. I almost got sick reading the biggest part of the book which describes the damage caused by us on ourselves – interestingly written as reports from the Star Beings who are watching, helpless, the absurdity of our behaviors and their failed attempts over many thousands of years to put the balance back into place. I here quote an extract of the end, a letter from one of the children who survived it all, as humans climb back into the light, at last. Then we were roaming about over the hillside and the plateau. There were about twenty of us doing this. Suddenly we all knew quite clearly where the city should be. We knew it all at once. Then we found a spring, in the middle of the place. That was how this city was begun. 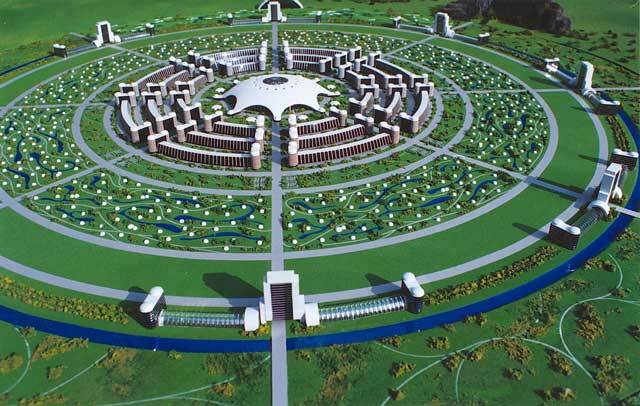 It is going to be a star city, five points. We found the right soil for bricks nearby and for adobe. There is everything we can need. We have already started the gardens and the fields. I was really moved. It is a great book (unfortunately, out of print). Several days later, I could see myself, building new villages with eco-friendly houses, in harmony with nature, and in awareness with the importance of sacred geometry, not only as a tool to feel good, but also to maintain harmony and balance between the inhabitants. As I am quite a solitary creator, It is quite new for me, to think in terms of community. 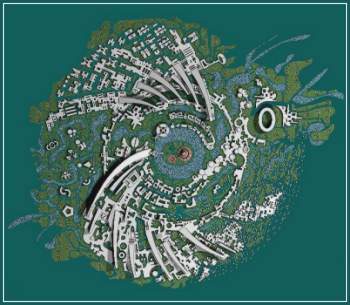 I discovered sacred geometry thanks to the works of Yann Lipnick, a French geobiologist whose book I am translating into english a the moment. He studies intensely the ways in which the ancients built their temples and sacred locations aligned with cosmo-telluric influences. Fascinating! I started to look into architecture for development, but nothing really interesting came up for now. I always feel it is missing the energetical dimension, on the scale of a town. A friend reminded me of Auroville! Of course! That is exactly a new city being built in this day and age. There is also the Venus Project and the grandiose and enlighteed visions of Jacque Fresco (although I would like to work on a smaller scale). Check out their videos! It’s sci-fi material but it is happening! If anyone has other ideas to feed my research, I welcome them gladly. What amazed me is that Lessing published her novel …in 1979. Merci Bruno! Je viens de découvrir à l’instant qu’un ami d’une très bonne amie fait partie de ce projet (dingue)! Marianne, I’m happy to learn that you are translating Yann Lipnick books in english ! I did a course with him in last June and was amazed by what I experienced with him, he’s a great guy. I will go to Findhorn in Scotland (a spiritual community close to Auroville spirit) next spring for three months, and as Findhorn people are every sensitive to nature spirits, I’m ready to advertize there the translation you are making…! I will pass on the information to Yann. I am sure he will be very interested. FYI, the second volume of his series: « Invisible Presences – Guardians of the Earth » is already available in english as a downloadable pdf on his website. It is just tricky to order if you can’t read french. I have been dreaming to go to Findhorn ever since I leant about nature spirits years ago! They are really the pioneers on this subject. Maybe one day we’ll catch up at one of Yann’s trainings? I am meeting him on Saturday to visit the Bourges cathedral. The nature spirit training is great. It’s the first one I did.